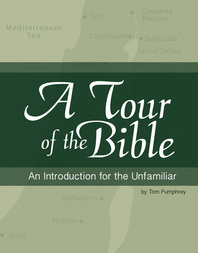 A Tour of the Bible provides an overview of and orientation to the Bible, including outlines and summaries of each section and book of the Bible, with basic story lines and their significance. Along the way, sample the Bible’s highlights by reading “The Bible’s Greatest Hits” to help find the gems amidst the genealogies. For those who want to learn more, A Tour of the Bible includes reference material about how the Bible was formed, how to compare different Bible translations, and guides for how to read through the Bible. Available through Ingram distribution including Spring Arbor and Amazon. Tom Pumphrey is the Rector (pastor) of the Church of St. Peter and St. Paul in Marietta, Georgia. He is a graduate of Cornell University and Virginia Theological Seminary. Tom served parishes in the Philadelphia area for nine years where he became known for his teaching and consulting in church leadership. He also developed numerous courses and resources for surveys of basic Christian teaching. Click here for more info.